This is the ONLY thing to think about in the 2016 election….! ! ! ! A lot of people have brought up the fact that they won’t vote for Trump if he’s the eventual nominee. Let’s put something in perspective. Justice Scalia’s seat is vacant. Ginsberg is 82 years old, Kennedy is 79, Breyer is 77, and Thomas is 67. Nowadays, the data shows that the average age of a Supreme Court retirement or death occurs after 75. Everyone saying that they won’t vote for one candidate or the other if they are the GOP nominee, please realize this. If Hillary Clinton wins and gets to make these appointments, you likely will never see another Conservative victory at the Supreme Court level for the rest of your life. Ever. If you are a Conservative, a vote for anyone but a GOP nominee, whomever that will be, is a vote for Hillary Clinton…. Think about it, or we’re all SCREWED! We are witnessing the end of the House of Clinton…. 2. You could feel it when Republican front-runner Donald Trump hit back — hard — over the “penchant for sexism” charge by basically calling Hillary Clinton an enabler in the former president’s sexual shenanigans. 4. Then came further reports about an expanded FBI probe of her handling of secure information; the nexus of State Department favors for donors to the Clinton Foundation; and the story that Hillary Clinton or her staff might have lied to FBI agents in this probe. 5. All of this has raised the speculation, yet again: Will President Obama stop the Department of Justice (DOJ) from indicting her if the eight-person DOJ team working with over 100 FBI agents recommends criminal charges? 6. The president will be in an odd situation: He ran against the Clintons. He is known to loathe Bill Clinton. He apparently does not want the Clintons back in charge of the Democratic Party (thus removing the thousands of Obama acolytes with cushy patronage jobs). 7. So: If the DOJ recommends an indictment and he K.O.’s it, he will have his own legacy smeared with a permanent taint of having covered up for the Clintons. 8. If he allows an indictment to move ahead, that will be the end of Hillary Clinton’s campaign. Period. She may think she can march on despite charges, but that would be self-delusional. Her campaign will be finished the day charges are filed by Obama’s Justice Department. 9. She can’t claim “politics as usual” or that old “right-wing conspiracy” nonsense as this will beObama’s Justice Department — not a Republican-controlled entity — bringing these charges. 10. Now, even without an indictment, Hillary Clinton’s fortunes are rapidly sinking. 11. As of today, she is on track to lose both the Iowa caucuses and the New Hampshire primary — to an unelectable 72-year-old Vermont socialist! 12. That tells us how politically weak and out of it the Clinton machine has become. 13. It is no coincidence that Vice President Joe Biden has suddenly resurfaced — first in a Hartford, Conn. TV interview stating that he regrets not running “every day,” and then by softly criticizing Hillary Clinton for not leading on the anti-1 percent front. 14. Biden may very well be warming up in the bullpen for a possible emergency entry into the Democratic field once Clinton is charged and has to withdraw. 15. In the meantime, we see a frantic, panic-stricken Clinton family out on the stump hitting Sen. Bernie Sanders (I-Vt.) on healthcare and guns. But they’re hitting him from the center on healthcare — not the left, where the votes are. 16. They are running national TV ads on guns on MSNBC; there are ads every few minutes. If Team Clinton members think they can turn around her negative trajectory over guns, they are sorely mistaken. 17. Economics is the main issue. 18. And Hillary Clinton is seen as being in the tank for corporate interests, while Sanders has stood up to them. Period. That is the race. 19. The 2016 campaign is a political revolution. 20. The House of Bush is also falling. 21. So is the Establishment of both political parties. 22. Who is more establishment than the Clintons and the Bushes? 23. Who has milked the political system for more money, gigs, access and cushy jobs for cronies than the Clintons and the Bushes? 24. But this is the year that the public is standing up to the status quo. 25. We are witnessing history: the fall of the Houses of Clinton and Bush. “DHS is like a prison environment, complete with prison snitches,” “We’ve all been threatened”, says one DHS insider recently to a writer from Canada Free Press. Under the cover and amid the distraction of the Christmas bustle, I had my last “official” contact with a source inside the Department of Homeland Security known as “Rosebud” in my writings. My source is leaving his position, retiring along with numerous others choosing to leave this bureaucratic monstrosity.For this contact, my source took unprecedented measures to be certain that our contact was far off the radar of prying government eyes and ears. I was stunned at the lengths he employed, and even found myself somewhat annoyed by the inconvenience that his cloak-and-dagger approach caused. It was necessary, according to my source, because all department heads under FEMA and DHS are under orders to identify anyone disclosing any information for termination and potential criminal prosecution. “According to every internal document I’ve seen and read, and from the few people I’ve spoken with who understand what’s going on, preparations have been finalized to respond to a crisis of unprecedented magnitude within the United States. The response will include the use of lethal force against U.S. citizens under the instructions of Barack Obama.” But why? “I don’t mean to sound repetitive, but I can’t stress this enough. Contrary to what you hear, we’re already in an economic collapse, except that most people haven’t a clue. The ‘big bang’ comes at the end, when people wake up one morning and can’t log in to their bank accounts, can’t use their ATM cards, and find out that their private pension funds and other assets have been confiscated,” he stated. “I’ve seen documentation of multiple scenarios created outside of DHS. Different plans and back-up plans. Also, please understand that I deliberately used the word ‘created,’ as this is a completely manufactured event. In the end it won’t be presented that way, which is extremely important for everyone to understand. What is coming will be blamed on some unforeseen event out of everyone’s control, that few saw coming or thought would actually happen. Then, another event will take place concurrent with this event, or immediately after it, to confuse and compound an already explosive situation.” I asked for specifics. “As I said, there are several scenarios and I don’t know them all. I know one calls for a cyber-attack by an external threat, which will then be compounded by something far removed from everyone’s own radar. But it’s all a ruse, or a pretext. The threat is from within,” he stated. “Before people can regain their footing, a second event will be triggered.” Again, I asked for specifics. “Please note a few final things. The relationship that exists between DHS today and the executive branch is well beyond alarming. 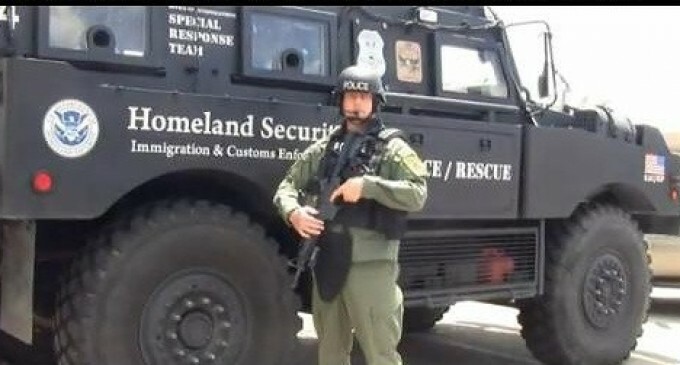 DHS and other organizations have become the private army of the Oval Office. The NSA, and I’ve got contacts there, is taking orders from the Oval Office. The IRS is under the virtual control of the Oval Office in a manner that would make Nixon cower. Even though all roads appear to lead to the Oval Office, they lead through the Oval Office. It’s not just Obama, but the men behind him, the people who put him there. The people who put him there are the ones who created him.” I asked who created him. As often said by another of my sources, the U.S. is a captured operation. The lie is bigger than most people realize or are willing to confront. That is, until there is no other option. 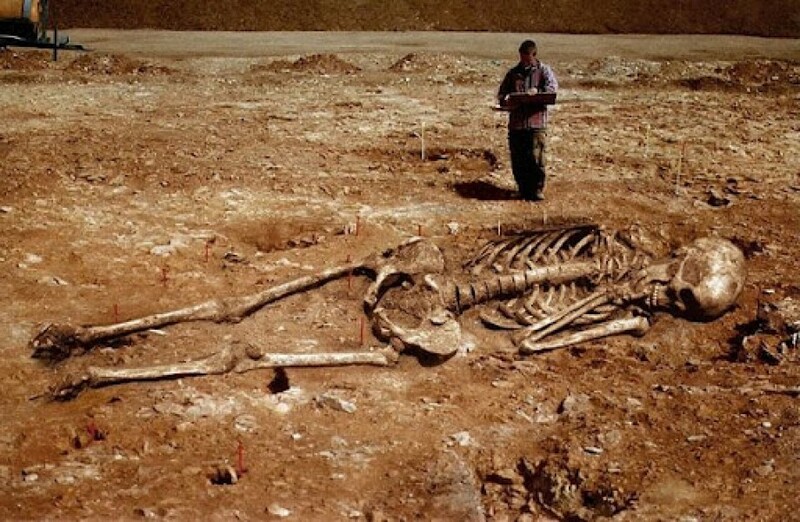 By then, it might be too late. 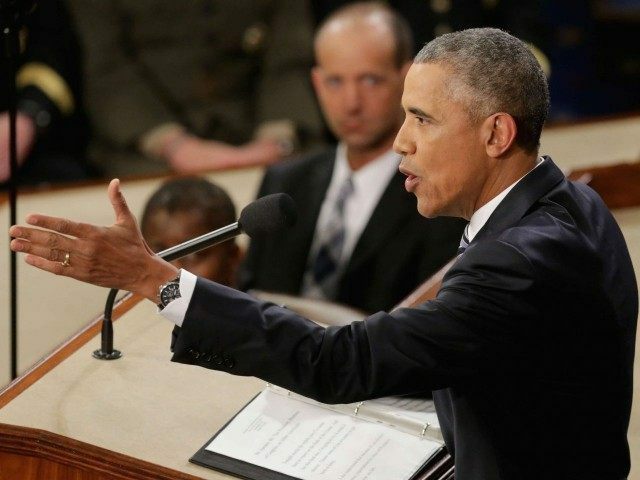 What Obama Got Wrong in the State of the Union…. Heritage Foundation experts weighed in on the policies President Barack Obama mentioned in his last State of the Union address. Here is what they had to say after the president’s speech. President Obama boasts America is in the “middle of the longest streak of private-sector job creation in history.” On paper, he is right. But the economy is far from booming. While the labor market has improved, it remains much weaker than before the recession hit. As Obama noted, the unemployment rate has fallen and the economy has added jobs. Unfortunately, much of this improvement comes from Americans dropping out of the labor force. People not looking for work do not count as unemployed. Yet, they still lack jobs. The employment rate for 25-54 year olds remains over 2 percentage points below pre-recession levels. Most of the hiring the president touted was simply job creation keeping pace with population growth. Those Americans who did lose their jobs still have a hard time finding new work. The average unemployed worker has spent over six months jobless. That is longer than any time between the end of World War II and Obama’s inauguration. Workers have good reason to feel anxious about the economy. Proponents of renewable energy consistently argue that renewables create more jobs per kilowatt hour and thus are a good investment. 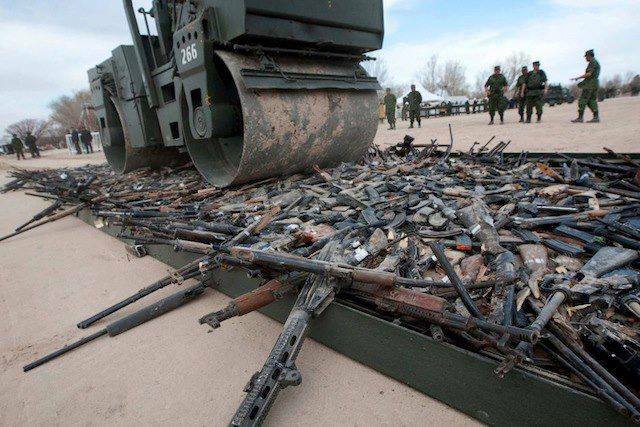 If that’s the recipe for job creation and economic growth, we can scrap using machinery to pave roads and grow crops. By Obama’s logic, we can create more jobs by giving people shovels to perform those duties. That would certainly create jobs, but it would also significantly reduce productivity. If we can produce more energy with less labor, that frees up human resources to be productive elsewhere in the economy. Importantly, there are several key omissions from Obama’s statement. Heavy-handed regulations devoid of any meaningful environmental benefit are driving out coal as an important, reliable energy source and destroying jobs in the process. Solar benefits from generous taxpayer-funded subsidies and while the costs are coming down, solar still remains one of the priciest ways to generate electricity. As Obama said, “I believe a thriving private sector is the lifeblood of our economy.” The oil and gas boom is but one shining example. The President argued that automation has become uniquely challenging for American workers. It’s a strange problem to highlight, for two reasons. First, economists have found no historical relationship between automation and employment rates. In the past, workers who lost their jobs because of technology always found new work. Automation only seems like a threat because finding new jobs in Obama’s recovery has been historically difficult. Second, the rate of automation has slowed sharply since 2003. Employers are finding fewer new ways to automate labor in this decade than they did in the last. 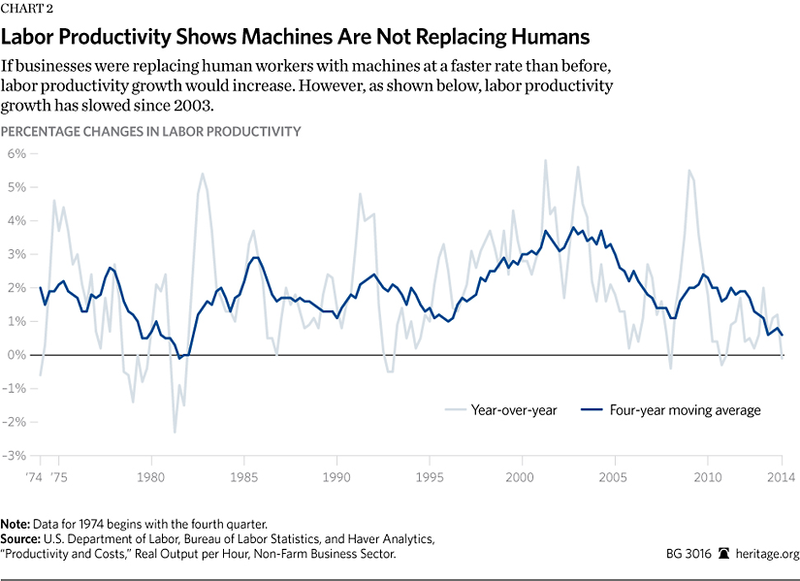 Increased automation increases labor productivity; it allows employers to produce their goods with fewer man hours (and more machine hours) than before. But the Bureau of Labor Statistics finds labor productivity has slowed for the past decade. Automation has become a smaller challenger for workers than it was in the past. The economy faces many challenges. Robots broadly eliminating the need for human labor is not among them. No, recklessness on Wall Street did not cause the financial crisis, a host of terrible government policies did. President Bill Clinton’s National Partners in Homeownership set a completely arbitrary goal of increasing home ownership, and it turned out most qualified homebuyers already owned homes. All the additional lending helped to create a housing bubble and increased consumer debt, and the capital requirements that federal regulators imposed on the financial system spread risky loans throughout the markets. The ever-increasing socialization of losses, by both implicit and explicit government guarantees, added fuel for the fire. The system that gave us the crisis – affordable housing goals, shaky underwriting standards and Fannie and Freddie – remains largely in place. If we want to prevent another crisis,these policies need to be reversed. Energy is one of the last sectors of the economy that needs help from the federal government or a centralized plan. The laws of supply and demand work quite well. We have an abundance of resources, and a great deal of suppliers producing energy from a mix of energy sources. The global market for energy is a multi-trillion dollar opportunity. One energy consulting firm estimated that in 2011, world expenditures for energy totaled more than $6 trillion – 10 percent of global Gross Domestic Product and the second largest expenditure behind health care. The International Energy Agency projects that that tens of trillions of dollars of energy investment will be necessary to meet global energy demands over the next twenty years. Any company that has a viable technology will not need any help from the taxpayer or a government program. Profits will reward innovative ideas and promising technologies. He is right. But he has said that many times before. And, despite all the talk, his administration has done virtually nothing to reform or repeal the unnecessary red tape. Instead of rooting out outdated rules, he has added on record numbers of new ones. Overall, according to our annual “Red Tape Rising” report on federal regulation, 184 major new rules have been imposed on the American people since Obama took office, costing some $80 billion each and every year. The number of such rules pared back: only 17. So much for cutting red tape. Rather than the careful assessment of new and old rules the president spoke of, in practice his regulatory policy has been a one way ratchet toward ever more rules from Washington governing the lives of Americans. President Obama talked about long-term economic trends squeezing workers. 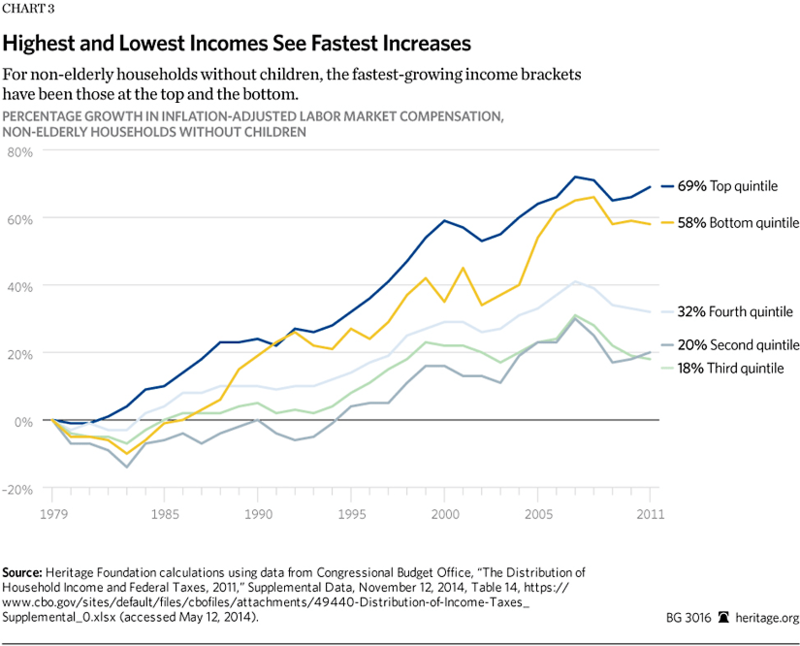 He should have made it clear this squeeze is a recent phenomenon.Congressional Budget Office data shows that workers at every income level prospered between 1979 and 2007. During that period non-elderly households in the middle quintile saw their labor market earnings rise by a third. Households in the poorest quintile saw their labor market income rise well over 50 percent. From the Reagan Presidency until the Great Recession, American economic opportunities expanded up and down the income ladder. Since the Recession and the slow Obama recovery that has changed. Between 2007 and 2011 (the most recent data available) labor income for non-elderly households in the middle quintile dropped roughly 10 percentage points. No wonder Americans are down on the economy. But these problems have predominantly occurred on Obama’s watch. That should make Americans skeptical that doubling down on his preferred policies would fix them. President Obama stated in the State of the Union tonight that “Social Security and Medicare are more important than ever; we shouldn’t weaken them, we should strengthen them.” Beyond catering to his political base, Obama offered no details on how he would strengthen these programs. Obama failed the nation during his term thus far when it comes to reforming Social Security and Medicare. Despite his 2009 promise that “some of the hard decisions are made under my watch, not someone else,” we’ve seen very little action from the president on accomplishing this feat. Unsustainable, poorly conceived cuts to Medicare from Obamacare and a bailout of Social Security’s disability program can hardly be counted as entitlement reform. One of every $10 produced by the U.S. economy in fiscal year 2015 was spent on only three federal programs: Social Security, Medicare and Medicaid. These three programs alone consume more than half of all federal spending and they are growing rapidly. The next president must lead on entitlement reform upon entering office. The Hippocratic oath enjoins doctors to “first, do no harm.” The president should keep that in mind with his job training proposals. He suggested sending unemployment insurance recipients through federal job training. But evaluations find one of the major federal job training programs makes it harder for workers to get jobs. The federal government funds “Trade Adjustment Assistance” benefits for workers who lose their job to foreign trade. The program includes generous federal subsidies and free job training. You might expect this to improve displaced workers’ incomes. But when Mathematica evaluated the program, it found participants made $27,000 less than workers outside the program. What happened? Trade Adjustment Assistance encouraged jobless workers to enroll in federal job training programs instead of looking for new work immediately. But the job training didn’t improve their job prospects. So they wasted over a year they could have spent job hunting in a training program employers didn’t value. Workers never fully recovered from missing those potential job opportunities. Even the federal subsidies only partially made up their losses. The unemployed workers would have made more money skipping the training program, even if it meant forgoing the federal subsidies. Congress should think carefully before creating another federal job training program. They could easily wind up hurting the workers they want to help. Once again, President Obama made a cursory mention of infrastructure in his State of the Union, claiming that if only the federal government would spend more taxpayer money (gleaned from higher taxes on fossil fuels), the government can “put tens of thousands of Americans to work building a 21st century transportation system.” But as innocuous as this agenda sounds, it fundamentally misses the mark. Using government spending to stimulate job creation was a cornerstone of the Obama stimulus plan that ultimately failed to produce the “shovel ready” jobs the president promised. A big problem is that infrastructure projects take a long time to plan and require highly-skilled labor, meaning that spending on these projects is ineffective at creating new jobs for recently unemployed Americans (most of whom lack the necessary job skills). The federal government has a very poor track record as a job creator, and spending on infrastructure is no exception. Instead, transportation infrastructure should focus scarce resources on enhancing mobility and relieving congestion so that American workers, businesses, and travelers all over the country can get where they need to go. At this, the top-down federal transportation program has been ineffective. The federal gas taxes that were originally intended to maintain the Interstate Highway System – a true national priority – are diverted to various special interests by Congress and federal bureaucrats. Over a quarter of gas taxes are siphoned to projects that are not proper federal priorities, such as local transit and bike-share programs, while a mere six percent goes to the actual construction of major projects. Due to perennial overspending on transportation projects, the federal Highway Trust Fund has required over $140 billion in bailouts since 2008. And even though the president pledged that we should not “subsidize the past”, the federal government spends millions in subsidies incentivizing cities to build cumbersome and expensive streetcar projects, which last saw their heyday in the early 20th century. Federal promises of job creation and effective infrastructure investment have floundered. Rather than continuing the one-size-fits all approach out of Washington that has left millions of Americans stuck in traffic, the federal government should get out of the way to empower the states and private sector–who can best gauge local priorities–to truly build a 21st century transportation system. The key factor for Congress to evaluate will be whether TPP really doespromote open markets and economic freedom. If it does, workers and the environment will benefit. The latest rankings of trade freedom around the world in the Heritage Foundation’s forthcoming 2016 Index of Economic Freedom confirm that citizens of countries that embrace free trade are better off than those in countries that do not. The data continue to show a strong correlation between trade freedom and a variety of positive indicators, including economic prosperity, low poverty rates, and clean environments. Obama missed an opportunity to explain the benefits of trade when he said, “Companies in a global economy can locate anywhere, and face tougher competition. As a result, workers have less leverage for a raise.” In fact, the global economy brings enormous benefits to workers, both through importsused by American manufacturers to compete, and through jobs provided to nearly 6 million workers thanks to foreign investment in the United States. President Obama’s suggestion that government should become further entangled in the education and care of the youngest Americans would not serve children or taxpayers well. Washington already has a poor track record engaging in K–12 education, with federal spending more than doubling over the past three decades while academic achievement and attainment has languished, particularly among low-income students. Further federal intervention in preschool and childcare will crowd out the private provision of care, increase costs for taxpayers, and will fail to create lasting academic benefits for children, as recent evaluations of state and federal programs have demonstrated. A large-scale evaluation of the federal Head Start program found the program had no impact on the academic outcomes, social-emotional well being, health outcomes, or parenting practices of participants. More federal intervention in preschool and childcare will also fail to address deeper social issues while being largely duplicative of existing efforts, as nearly three-quarters of four-year-olds are already enrolled in some form of preschool. The president’s proposal to provide “free” community college is not the solution to the college affordability problem. Students who are low-income already have access to federal student aid such as Pell Grants, which can be used to finance the cost of attending community college. So the proposal will serve as little more than a federal handout to the community college system. Community colleges also face their own challenges, with less than 20 percentof first time students enrolled in community colleges graduating within three years. America’s $1.2 trillion student loan tab presents a serious problem in our economy. Americans would be better served by policies that actually help to lower higher education costs, making higher education an engine of upward mobility for American who choose to pursue it. That goal requires broad reforms to accreditation, reforms to federal student aid programs, and streamlining and reducing burdensome regulations and requirements that permeate higher education today. Today, the terror group poses more of a threat to the world than ever before. As recent Heritage Foundation research pointed out, in the past two years ISIS has established a presence in 19 countries. Foreign fighters are flocking to the wannabe caliphate in droves. In Syria and Iraq, ISIS controls territory the size of Maryland and rules over a population equivalent to Virginia’s. Although ISIS was recently kicked out of the Iraqi town of Ramadi, it still occupies Mosul—Iraq’s second largest city of almost 2 million people. Obama’s remarks tonight reaffirmed what everyone already knew: that there is no strategy to defeat ISIS and he cannot wait to pass the buck to his successor. Even though the U.S. dropped 22,110 bombs against ISIS in 2015 (by comparison, during the first 30 days alone of the 2003 Iraq invasion the U.S dropped 29,000 munitions) the air campaign has achieved minimal success on the ground. The administration’s program to train and equip so-called ‘moderate’ Syrian rebels has been a complete failure—to the tune of $500 million. More importantly, the U.S. has failed at drumming up more support on the Arab Street to take on ISIS. Sadly, the next U.S. President will inherit a mess in the region. When it came to national security issues, President Obama’s State of the Union address veered from delusional to dishonest. He presented the American people with a series of false choices, straw arguments and inaccurate assessments regarding his track record. Regarding Islamic State (ISIS, or ISIL), Obama tried to downplay the existential threat they posed. The president has past form on this. It was, after all, his complacency towards the gathering strength of the group in 2013/14 (when he referred to them as a “jayvee team”) that helped ISIS grow into the threat it now truly is. Rather than learning this lesson, he instead focused his ire on those who “build [ISIL] up”. Obama went on to provide a list of initiatives that the U.S. was spearheading in the war against the group, which included efforts to “cut off ISIL’s financing, disrupt their plots, stop the flow of terrorist fighters, and stamp out their vicious ideology.” These were unusual examples to cite, because on every count, these efforts have failed. ISIS is stocked with foreign fighters, its ideology has spread across the globe, it has launched attacks in mainland Europe and it remains financially strong. Obama also dismissed the idea that theology could be at the heart of ISIS’s appeal, dubbing them simply “killers and fanatics”. Yet a refusal to acknowledge the religious component to ISIS’s activities is counter-productive. It is only by understanding the group’s appeal and its beliefs that we can subsequently cut off the sources of its recruitment. Obama constructed another straw man by claiming that “the lesson of Vietnam, of Iraq” was that the U.S. cannot “try to take over and rebuild every country that falls into crisis”. This was particularly absurd. No one seriously believes that the U.S. could or should take on such a role. It also ignores the fact that what Obama claims to be his “smarter” approach has led to disasters in Libya, Syria and Yemen, to name but three. Attempting to argue that his “patient and disciplined” strategy meant the U.S. was “leading international efforts to help that broken society pursue a lasting peace” in Syria was a particularly deluded attempt at recasting the situation there as anything other than an utter disaster. Almost seven years later, the so-called Russian ‘reset’ policy is now a Russian regret. Russia still occupies 20 percent of Georgia’s territory. Moscow’s imperialism has resulted in the illegal occupation and annexation of Crimea and a Russian invasion of eastern Ukraine. Russia is testing NATO in the Baltics, rebuilding its military bases in the Arctic, and has intervened in the Syrian Civil War with no regard to the consequences. Since taking office President Obama and many of those around him have assumed that Vladimir Putin is someone you can do business with, that Europe is no longer important, and that military power no longer buys the same influence on the world stage as it once did. These assumptions have led to bad policy decisions (such as the removal of 10,000 U.S. troops from Europe and drastic cuts to the U.S. military) by this White House that has emboldened Russian aggression and tested the transatlantic alliance to its limits. During the State of the Union address Obama glossed over Russia’s aggression. Astoundingly, the upcoming NATO Summit in July 2016, Obama’s last, did not even get a mention in the Commander in Chief’s 5,438 word long speech. In fact, the word NATO was not said at all. Just because a problem is ignored does not mean it will go away. As Heritage Foundation experts have pointed out, the U.S. needs a comprehensive grand strategy to deal with Russia. Unfortunately, it looks like America and her allies will have to wait for 2017 because this becomes a possibility. No doubt Putin will be taking advantage of the situation during the meantime. President Obama remained in denial about the disastrous nature of his Middle East policy throughout the small parts of his state of the union speech that dealt with foreign policy. He said that: “Priority number one is protecting the American people and going after terrorist networks.” That certainly was not the case in his last state of the union speech, which was the first that did not mention al-Qaeda since George W. Bush’s 2002 speech. He glossed over the uneven results of his half-hearted, slow-motion incremental response to the rise of ISIS and fumbling responses to the deepening crisis in Syria, where his administration has been consistently behind the curve. His optimism on defeating these two terrorist networks would be reassuring if he wasn’t the same misinformed person who told Americans that the war in Iraq had ended, that ISIS was a “J.V. team” and that ISIS was contained the day before it launched the Paris terrorist attacks that killed 130 people. Once again, President Obama used his State of the Union speech to urge Congress to work with him to close the terrorist detention facility at Naval Station Guantanamo Bay, Cuba (GITMO). But it is worth reminding everyone that GITMO is open for one reason and one reason only: because Obama failed to close the facility when the stage was set for him to do so. In 2009-2010, Obama’s own party held a 59-41 majority in the Senate, and a 257-178 advantage in the House of Representatives. If the president needed any legislation to close Guantanamo—a debatable point—or simply the political backing of the majorities in both houses of Congress, the stars were aligned for him to do so. But instead of working with Congress to close GITMO in 2009-2010, the administration engaged in a series of controversial moves that caused a bi-partisan uproar, resulting in the Democrat-controlled congress passing legislation that each year since 2009 has made it more difficult to close GITMO. Failing to lead has serious consequences. The window to close GITMO has come and gone. Today, the threats from al-Qaeda, the Afghan Taliban, ISIS and associated forces are very real. Transferring some of the 103 remaining detainees and moving the rest to the United States – in direct violation of a congressional statute passed with Democratic support – is not prudent. Changing the zip code of where we keep terrorist detainees will not alter the terrorists’ hatred for and attempted attacks against the United States one bit. The facts clearly demonstrate the ineffectiveness of President Obama’s radical new Cuba policy. Diplomatic recognition and increased commercial opportunities to the Castro regime have emboldened the military dictatorship. This has directly resulted in historic levels of repression against the anti-Castro opposition. It’s also resulted in a continuation of hostility against U.S. national security interests. Despite a year chock full of unilateral concessions, Havana continues undermining the U.S. and our interests. Dissidents have suffered historic levels of repression, even during Pope Francis’s visit to the island. Recently, it was discovered the regime has been in possession for over a year of an inert U.S. Hellfire Missile, which was shipped from Spain to the island. The administration has not been able to answer how it got there, or if other hostile countries have obtained sensitive defense technology from it. We must also keep in mind that it was only two summers ago when the Cuban government violated U.N. Security Council sanctions by clandestinely shipping weapons to North Korea. Perhaps one of the most petulant presidents in modern history, lectured the country during the State of the Union not to assume that people who disagree with them act with malice. And this same president, known for a slew of controversial executive actions on such important issues as immigration and the right to bear arms, grumbled that he could not act alone, but needed Congress. Obama appeared close to coming to grips with the fact that his peevish, sullen approach to politics has made things worse in Washington. “It’s one of the few regrets of my presidency – that the rancor and suspicion between the parties has gotten worse instead of better. There’s no doubt a president with the gifts of Lincoln or Roosevelt might have better bridged the divide,” said Obama. But then, Obama added, “But, my fellow Americans, this cannot be my task – or any president’s – alone.” Tell that to a Congress that keeps complaining that Obama does go alone whenever he doesn’t get his way on Capitol Hill. First President Obama called the Islamic State a “JV Team,” then he said they were “contained,” just before an ISIS inspired terrorist attack. Now Obama has characterized ISIS as “masses of fighters on the back of pickup trucks” during the State of the Union address. The president’s most recent characterization of ISIS again tries to downplay the terrorist group’s capabilities, suggesting it is something far less formidable than it actually is. ISIS is, however, armed to the teeth with tanks, Humvees, surface-to-air missiles, and artillery. It fields a conventional force that has routed a far-larger Iraqi military that was trained and equipped by the United States. It still controls swathes of territory in Iraq and Syria, and millions live under its subjugation. It is carving out a presence in Libya, and making a push to control that country’s lucrative oil fields. ISIS lost approximately 14 percent of its territory in 2015, but it is far from defeated. It is certainly not a ragtag band of second-tier terrorists, which is how Obama too frequently portrays the group. During the State of the Union, the President decried the mistrust between Republicans and Democrats. Frequently mischaracterizing the ISIS danger that is obvious to most Americans is precisely the sort of thing that breeds the very suspicion the president laments. President Obama offered his usual false alternative between occupying and rebuilding “every country that falls into crisis” (an option that literally no one is proposing), or agreeing with his foreign policy. Putting it that way is a cheat, not a choice. But let’s take the president at his word, which is that he wants the U.S. to “help remake” the international system that the U.S. built after 1945. Even he doesn’t seem sure about this, because a few lines later, he suggests instead that we should be seeking to strengthen that order, not remake it. And a president more grounded in history might wonder if it’s wise to want to remake the order: from 1815 to 1918 to 1945 to 1991, the system has been at its most flexible after the world has been exhausted by a major war, which isn’t what any of us want. Nor did the president suggest a single measure that would genuinely re-make the world order: from fighting terrorism to complaining about ungoverned spaces to lecturing Russia to talking about trade deals, his proposals (or rather, his applause lines) were all old hat. But yet, if his goal really is to remake the order, he’s actually doing a good job of it. That order was grounded on U.S. pre-eminence – but from Ukraine, to Syria, to Iran, it’s American weakness, not its strength or its leadership, that’s on display. A world order without American leadership would indeed be a new one. But it’s not one that most Americans, or most people around the world, would like. This “problem” of climate change is hardly one at all. Natural variations have altered the climate much more than man has. Proponents of global action on climate change will argue that 97 percent of the climatologists agree on climate change. There is significant agreement among climatologists, even those labeled as skeptics, that the Earth has warmed moderately over the past 60 years and that some portion of that warming may be attributed to manmade carbon dioxide emissions. However, there is no consensus that temperatures are increasing at an accelerating rate and we’ve seen them plateau for nearly two decades now. Even studies that have attempted to refute the 18-year pause in global warming show that the temperature trend is much less than that projected by climate models. And even though man-made greenhouse gas emissions have increased, the world has not experienced trends in the increased frequency or magnitude of extreme weather events. Heritage research has shown that the statistical models that the administration relies on to quantify the economic impact of climate change are heavily dependent upon certain assumptions and extremely sensitive to very reasonable tweaks to these assumptions. In fact, under some assumptions one of the models that the administration relies on suggests that there may even be net benefits to global warming. That’s right: benefits. The climate data simply does not suggest that man-made global warming should be at the top of the list of public concerns. Most importantly, even if you do believe the planet is heading toward catastrophe, the Obama administration’s climate agenda will drive up energy costs by driving out affordable energy sources for no meaningful climate reduction. We could grind all economic activity to a halt, hold our breaths forever, and cut carbon emissions to zero in the U.S. — and still only wind up lowering average temperatures by no more than 0.2 degrees Celsius by the end of the century. Politicians might want to start listening to those “lonely” climate voices and have an objective, scientific debate on climate change. But the reality of a government-forced shift away from carbon-emitting natural resources such as coal, oil and natural gas will be a net cost to the economy – not a net gain. And the math isn’t even close. At a time when 80 percent of America’s energy needs are met by these carbon-emitting energy sources, restricting their use will drive up costs for households and businesses. Carbon dioxide cutting policies will do nothing but kill jobs and stifle the American economy for years to come. Heritage research has found that the policies associated with these carbon cutting regulations will reduce aggregate gross-domestic product (GDP) by more than $2.5 trillion and kill hundreds upon thousands of jobs over the course of the next decade—all for a negligible impact on global temperatures. Manufacturing employment throughout the country will be hit particularly hard. Obama’s climate agenda is all pain, no gain. President Obama continues to distract from the legitimate disagreements Americans and their representatives in local, state, and federal levels of government have with this administration’s global warming agenda. Obama focused on painting a picture of “lonely” opponents who are anti-science. But even people who believe that global warming is a problem have disagreed with the President on how he has attempted to address it. Most notably, the cornerstone of Obama’s agenda – a pair of greenhouse gas regulations known as the Clean Power Plan – fail to meet the standards of the American system of government. The Clean Power Plan rules require states to meet carbon dioxide emissions reduction goals for existing power plants and to cap emissions of carbon dioxide from new power plants to levels that are so low as to effectively prevent any coal power plant from running without carbon capture and sequestration technology (technology which has yet to be proven feasible). As Obama said, “Our Founders distributed power between states and branches of government, and expected us to argue, just as they did, over the size and shape of government, over commerce and foreign relations, over the meaning of liberty and the imperatives of security.” But that system breaks down when decisions normally left to states and individuals are centralized in Washington. Regardless of political party or position on climate change or global warming, there are serious problems with the climate agenda that the Obama administration has attempted to push through. Americans footed the bill for billions of dollars in federal energy spending under the Obama stimulus package, which increased federal energy spending by over 2,000 percent. And yet politicians keep buying into the same mentality that got us Solyndra, which cost American taxpayers millions. $23.8 billion in tax credits will go to subsidize wind, solar, and other renewables over the next decade by the yet-again extension of production and investment tax credits for these energy sources. The wind production tax credit has been extended, re-extended, and retroactively extended 10 times, and the solar investment tax credit as it’s known today has been around since 2005 (though it goes back to the 1970s). As Obama pointed out, jobs in the solar industry have increased and solar energy is becoming more affordable. The same can be said for wind. And yet these industries have become dependent on federal support in the form of loan guarantees, targeted tax favors, and government programs. In the long run, targeted subsidies only hurt the industries they’re intended to help. Even the president’s stated goal of impacting global temperatures cannot be listed as among the benefits of forcing taxpayers to subsidize green energy technologies. According to the National Academy of Science, eliminating the tax credits would increase greenhouse gas emissions by only 0.3 percent. In fact, if the president were truly concerned about environmental impacts, he might consider that a very efficient wind farm would need 260 times the amount of land to produce the same amount of electricity as a typical nuclear power plant requires, the latter which produces virtually no emissions. Instead of defining the rules of the game as the government should do, the president’s vision for “all of the above” energy choices has consistently meant special treatment for his politically preferred energy resources. President Obama and his allies in Congress said that the Affordable Care Act would increase competition. In fact, there is no evidence that the law has increased the number of carriers in the insurance market. The absence of competition at the county level is stark. Another Heritage Foundation analysis of health plan participation at the state level shows that in 2013, there were 395 individual market carriers, and in 2015, under the exchange, there were 310, a 21.5 percent reduction. The president also said that if a person liked their doctor they would be able to keep their doctor. In fact, the law has made that access increasingly difficult. Insurance plan changes, and the loss of previous coverage, often resulted in a loss of physician or health care provider networks. For example, in April 2014, analysts at the Congressional Budget Office (CBO) found that the exchange plans had much narrower networks than they anticipated. While the narrowing of networks reduced plan costs and thus the cost of the government insurance subsidies, the effect has been to constrict enrollee access to medical providers. President Obama claims his health care law is a success. Yet public opinion does not follow. According to the Real Clear Politics average, the health care law has yet to see approval outweigh opposition. In its latest average, from November to January – public support flounders at 43.3 percent while opposition is at 51.7 percent. President Obama and his allies in Congress sold the Affordable Care Act (ACA) as a measure to lower health care costs for individuals, businesses and the federal government. The president even stated, repeatedly, that his version of health reform would lower health insurance premiums for the typical family by $2,500 per year. The exact opposite of what the president promised has occurred. Beginning in 2014, as Heritage has shown, the first full year of Obamacare, premiums in the individual market sharply increased in most states. In some states, the increases were dramatic; for 50-year-olds alone, there was a premium increase of 50 percent or more in 13 states. The administration likes to emphasize that premium subsidies are available to paper over the premium costs; but no person with an annual income above 400 percent of the federal poverty level (approximately $47,000) is eligible for those subsidies. This is a big hit on the middle class. In 2015, there was indeed a moderation of premium increases, but insurance deductibles continued to skyrocket: for the “silver” plans in the exchange – the benchmark plans – the average deductible was $2,927 for an individual and $6,100 for a family plan. In comparison, employer-based plans had traditionally low deductibles. The biggest “rate shock” hit those persons transitioning from employer to exchange coverage. (The average deductible in employer based health insurance – nationwide – is a little over $1,200 for individual coverage). As with premiums, there are also government subsidies to paper over the costs of these high deductibles. But no person with an annual income above 250 percent of the federal poverty level ($29,425) is eligible for those subsidies, and moreover, that assistance is only available if they enroll in a “silver” exchange plan – not bronze, gold or platinum plans. This is another big hit on the middle class. While the law has increased some insurance coverage, enrollment has fallen well short of the robust official projections. For 2016, the Congressional Budget Office (CBO) projected that there would be 21 million in the exchanges. More recently, the Obama administration conceded that the enrollment would be much less: a little more over 10 million. Based on previous experience, there is every reason to be skeptical of projections. In the Spring of 2014, the administration claimed that over 8 million persons selected plans on the government website. It later corrected itself and reported that the number of those selecting plans was 7.3 million. Toward the end of 2014, around the time of the Christmas holidays, the Department of Health and Human Services (HHS) said the correct number at 6.7 million. For 2015, CBO projected 13 million people in the exchanges. But then, HHS said that 11.7 million signed up. HHS later announced that between 9 to 9.9 million were expected to enroll by the end of 2015. About 17 percent of 2014 enrollees, HHS projected, would not renew in 2015. Enrollment depends on a variety of things: how people felt about their experience, the cost the deductibles, the networks, their satisfaction with their coverage in the exchange, the opportunities to re-enroll in employer-based coverage, and various other factors. Projections are, of course, a poor substitute for raw data. Examining the final data for 2014 confirmed the ACA’s enrollment pattern due mostly to expansion of coverage through Medicaid, a poorly performing welfare program, where roughly one in three enrollees have trouble finding a doctor to care for them is hardly progress toward an expansion of quality care. At the time of passage of the Affordable Care Act, the president also insisted, routinely, that if persons like their current plan, they would be able to keep their current plan. That also turned out to be untrue. Heritage research showed that for the first three quarters of 2014 while Individual private market coverage in the exchanges grew by over 6.3 million, the number of persons with employment based coverage declined by 4.9 million. So, based on the raw data, concern over a loss of employment based coverage was justified. While not raised tonight, the president and his allies in Congress repeatedly charge that congressional opponents have no alternative health plans. This charge is flat out false. Republican Sens. Hatch, R-Utah, and Burr R-N.C., and Rep. Upton, R-Mich., produced a health plan replace blueprint. Rep. Tom Price, R-Ga., and members of the Republican Study Committee have authored comprehensive health plans. Before that Speaker Paul Ryan included major health reforms in his “Road to Prosperity” proposal. Meanwhile, conservative public policy institutes including the Heritage Foundation, the American Enterprise Institute, the Manhattan Institute, the Goodman Institute, and many others, have outlined comprehensive plans to reform the health care system. All are united on common objectives: the reform of the tax treatment of health insurance, reform of Medicare and Medicaid, the reduction of federal regulation and the creation of open markets driven by consumer choice and competition. President Obama has previously said that no taxpayer making less than $250,000 would face increased taxes. This was also clearly untrue. In fact, as Heritage Foundation analysis has shown, the bulk of the taxes imposed through Obamacare would directly impact middle or low income persons or be passed on to them in higher health care costs. This is particularly true of the tax penalties that accompany the individual and employer mandate, the medical device tax, and the federal health insurance fees. Taxes imposed on companies such as the so-called “Cadillac Tax” on high value health plans, the elimination of the employer deduction for Part D drug subsidy will also directly affect middle income citizens. At the beginning of his speech, President Obama voiced his support for bipartisan criminal justice reform. The President is correct that this does present an opportunity. Indeed, Republican and Democratic governors have been leading that reform effort throughout the country, as incarceration rates have continued to fall due to innovative approaches to fix our criminal justice system. Congress will have the opportunity to consider bipartisan proposals such as the Smarter Sentencing Act, the Recidivism Reduction and Public Safety Enhancement Act, as well as much-needed mens rea (criminal intent) reform, all designed to make our criminal justice system more fair and more effective for all Americans. Proposals along these lines merit serious consideration. The president stated that “we have to reduce the influence of money in our politics, so that a handful of families and hidden interests can’t bankroll our elections – and if our existing approach to campaign finance can’t pass muster in the courts, we need to work together to find a real solution.” This statement ignores the fact that individuals have a First Amendment right to spend their money to engage in political speech, as the Supreme Court has recognized. Moreover, the notion that “a handful of families and interests” bankroll our elections is inaccurate and misleading. Put simply, there is no need “to find a real solution” to a supposed campaign finance “problem” that does not exist. The president stated that “we’ve got to make voting easier, not harder, and modernize it for the way we live now. And over the course of the year, I intend to travel the country to push for reforms that do.” There is simply no credible evidence that voting is unnecessarily hard, nor that undefined “reforms” are needed to “modernize” it. Rather, to the extent there are problems associated with voting, they arise out of the hundreds of cases of criminal voter fraud that have been documented and published on the Heritage Foundation’s website. To deal with this problem, election officials should seek to guarantee the sanctity of the ballot box by taking steps to prevent fraud, including in particular cleaning up voter registration rolls and verifying voter IDs. President Obama talked about fighting poverty by expanding the Earned Income Tax Credit (EITC) for childless adults. It’s a strategy that, as the President noted, has also been promoted by House Speaker Paul Ryan, R-Wisc. However, increasing EITC for single, childless adults would increase marriage penalties already rampant in the government’s means-tested welfare system. Absent fathers and other single individuals would only be eligible for the expanded tax credit until they married. Marriage is the greatest protection against child poverty. Children in married-parent homes are 80 percent less likely to be poorcompared to their peers in single-parent households. Tragically, more than 40 percent of children are born outside of marriage every year. Rather than increase marriage disincentives in the government’s massive welfare system, policymakers should look for ways to reduce these penalties and strengthen marriage. The report, which Cameron presented to the House of Commons on Thursday, described the Muslim Brotherhood as anti-democratic, openly supportive of terrorism, dedicated to establishing an Islamist government — and opposed to the rule of law, individual liberty, and equality. “The main findings of the review support the conclusion that membership of, association with, or influence by the Muslim Brotherhood should be considered as a possible indicator of extremism,” Cameron said. Britain also will continue to uphold the European Community’s freeze on the assets of Hamas, another terrorist group with ties to the Brotherhood, Cameron said. The Obama administration quickly condemned the report in a statement to the Investigative Project on Terrorism, saying that the Muslim Brotherhood had a history of nonviolence and that opposing the group could lead some members to become radicalized. President Barack Obama has long embraced the Muslim Brotherhood and has defended and promoted Islam in an effort to fight Islamophobia.